It may be old hat—but it’s true gold | Where to next? The Berlin Gold Hat in the Neues Museum. Another Neues Museum treasure is the Berlin Gold Hat. This Late Bronze Age artefact is displayed in a room by itself (like Nefertiti) and is accompanied by an elaborate array of descriptions. This is the best preserved specimen of the four known conical golden hats—all from Central Europe. This one was found in Germany. 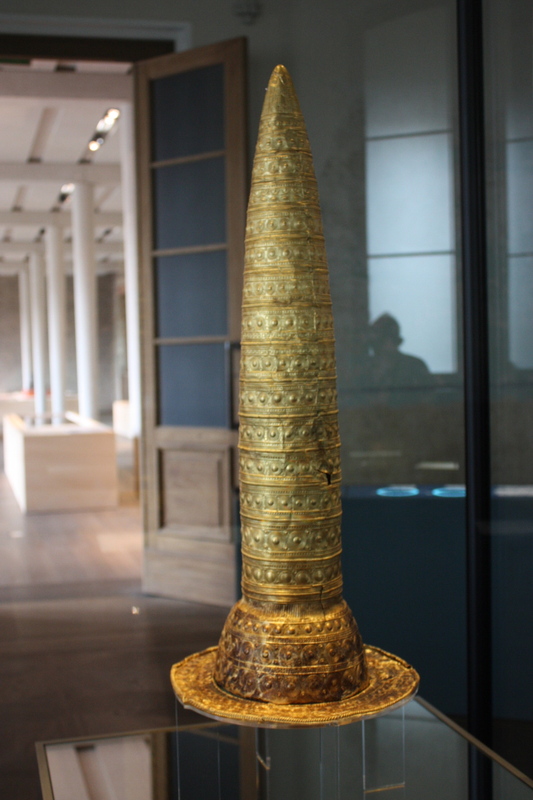 Hammered from a single piece of gold alloy (a mix of gold, silver, copper and tin), the hat stands 475mm high and weighs almost half a kilo (one pound). The average thickness is a mere 0.6mm. The amount of gold used would form a cube of only 3cm. It is generally assumed that the hats served as the insignia of deities or priests. There is also a view that the hats had an astronomical and/or calendrical function. Museum nuts should also see the entries on Nefertiti, the Neues Museum and eyes (all in the German category). Good luck. I think I didn’t say because no one was sure. Let me know if you find anything.